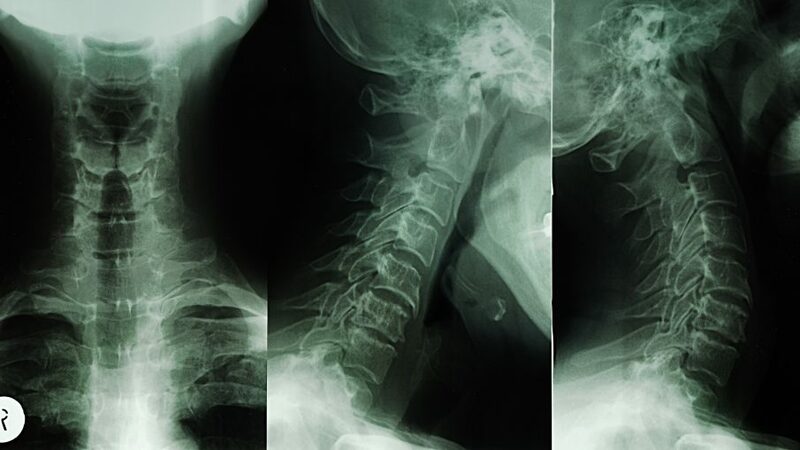 Cervical spine instability | Recent research on the role of Prolotherapy as treatment for clinical cervical spine instability and chronic neck pain. Recent research on the role of Prolotherapy as treatment for clinical cervical spine instability (CCSI) and chronic neck pain. Prolotherapy is a nonsurgical regenerative injection technique that introduces small amounts of an irritant solution into the cervical spine to strengthen the cervical neck ligaments. Researchers from Caring Medical Regenerative Medicine Clinics writing in the European Journal of Preventive Medicine investigated the role of Prolotherapy in the reduction of pain and symptoms associated with increased cervical intervertebral motion, structural deformity and irritation of nerve roots. Ninety-five percent of patients reported that Prolotherapy met their expectations in regards to pain relief and functionality. Significant reductions in pain at rest, during normal activity, and during exercise were reported. Twenty-one study participants were selected from patients seen for the primary complaint of neck pain. Following a series of Prolotherapy injections patient reported assessments were measured using questionnaire data, including range of motion (ROM), crunching, stiffness, pain level, numbness, and exercise ability, between 1 and 39 months post-treatment (average = 24 months). Eighty-six percent of patients reported overall sustained improvement, while 33 percent reported complete functional recovery. Thirty-one percent of patients reported complete relief of all recorded symptoms. No adverse events were reported. “The capsular (neck) ligaments are the main stabilizing structures of the (cervical) facet joints in the cervical spine and have been implicated as a major source of chronic neck pain. Chronic neck pain often reflects a state of instability in the cervical spine and is a symptom common to a number of conditions described herein, including disc herniation, cervical spondylosis, whiplash injury and whiplash associated disorder, postconcussion syndrome, vertebrobasilar insufficiency, and Barré-Liéou syndrome. When the capsular ligaments are injured, they become elongated and exhibit laxity (looseness), which causes excessive movement of the cervical vertebrae. In the upper cervical spine (C0-C2), this can cause a number of other symptoms including, but not limited to, nerve irritation and vertebrobasilar insufficiency with associated vertigo, tinnitus, dizziness, facial pain, arm pain, and migraine headaches. In the lower cervical spine (C3-C7), this can cause muscle spasms, crepitation, and/or paresthesia in addition to chronic neck pain. A patient case history published in the Journal of Prolotherapy: A 47-year-old female with a history of headaches, chronic pain in the neck and upper limbs, and intermittent tingling in one arm. Members of this same research team, lead again by Ross Hauser, MD recorded these observations in the Journal of Prolotherapy of a 47 year-old female patient treated with Prolotherapy. Case presentation: A 47-year-old female with a history of trauma presented to our clinic in 2013 with headaches, chronic pain in the neck and upper limbs, and intermittent tingling in one arm. Pain was exacerbated by head movement. Examination showed crepitation at C0 – C2, and severe spasms and tenderness in the trapezius and paraspinal muscles. The patient was treated with dextrose prolotherapy at each of four visits over five months. Digital motion X-ray (DMX) was performed between visits 1 and 2, showing straightening of cervical lordosis and upper and lower cervical instability, with offsets of right and left lateral masses of C1 on C2, anterolisthesis of C2 on C3 and of C3 on C4, capsular ligament damage at C6-C7 and facet hypertrophy at C4-C5. At visit 2, tingling and crepitation had abated, while pain intensity was unchanged. At visit 3, headaches had resolved, and pain had become more localized. At visit 4, pain intensity had decreased significantly, crepitation had resolved completely, and she had begun bicycle exercise. DMX x-ray one month after visit 4 showed persistent straightening of lordosis and facet hypertrophy, as well as some anterolisthesis, while the offsets of the lateral masses of C1 on C2 with rotation were reduced by 33-50%. Studies like these above show that simple non-surgical application of Prolotherapy injections can help patients with chronic neck pain and instability. As cited in the research above: “Based on clinical studies and experience with patients who have visited our chronic pain clinic with complaints of chronic neck pain, we contend that prolotherapy offers a potentially curative treatment option for chronic neck pain related to capsular ligament laxity and underlying cervical instability. Would you like to reach the doctors of these studies to see if you are a candidate for treatment? Contact Caring Medical and Regenerative Medicine Clinics? 2 Steilen D, Hauser R, Woldin B, Sawyer S. Chronic Neck Pain: Making the Connection Between Capsular Ligament Laxity and Cervical Instability. The Open Orthopaedics Journal. 2014;8:326-345. doi:10.2174/1874325001408010326. 3. Hauser R, Steilen-Matias D, Fisher P. Upper cervical instability of traumatic origin treated with dextrose prolotherapy: a case report. Journal of Prolotherapy. 2015;7:e932-e935.